Abstract. Detecting misuse of datatypes in an application code is a desirable feature for an MPI library. To support this goal we investigate the class of hash functions based on checksums to encode the type signatures of MPI datatype. The quality of these hash functions is assessed in terms of hashing, timing and comparing to other functions published for this particular problem (Gropp, 7th European PVM/MPI Users’ Group Meeting, 2000) or for other applications (CRCs). In particular hash functions based on Galois Field enables good hashing, computation of the signature of unidatatype in O(1) and computation of the concatenation of two datatypes in O(1) additionally. MPI datatypes are error prone. Detecting such errors in the user application code is a desirable feature for an MPI library and can potentially provide an interesting feedback to the user. Our goal is to detect when the type signature from the sender and the receiver do not respect the MPI standard. The cost of doing so should be negligible with respect to the cost of the communication. The idea was previously mentioned by Gropp  and we merely agree with his solution and speciﬁcations that we recall in Section 2. In Section 3, we give a more general framework to his study that enables us to rederive his solution but also create new solutions. In particular, our hash functions have the property of being O(1) time to solution for computing the signature of an unidatatype. 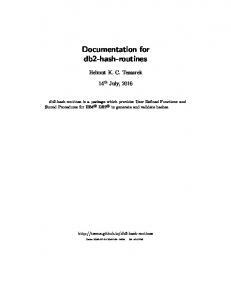 We conclude with some experimental results that assess the quality of our hash functions in term of hashing and timing. The codes to reproduce the experiments are available online . beginning of the type signature of the receiver. For the remaining of this paper we consider that the type signature of the sent datatype exactly matches the type signature of the received datatype (in its whole). (The case of a type signature of the datatype of the receiver longer than the one of the sender is dealt in the last paragraph of the paper.) In the framework developed by Gropp , a hash function is used to create a signature for the type signature of the datatype of the sender, the receiver then checks whether the signature of the sender matches the signature of the type signature of its datatype. Note that some errors might still be unnoticed when two type signatures have the same hash value. At this point of the speciﬁcation, any hash functions existing in the literature would be adequate. However, the fact that MPI datatypes can be combined together implies that we would like to be able to eﬃciently determine the signature of the concatenatenation of two datatypes. (Note that this is not only a desirable feature but also mandatory since we want to check the datatype when the count of the sender and the receiver mismatch.) The datatype signature function σ shall be such that the signature of the concatenation of two datatypes can be obtained from the signatures of the two datatypes, we therefore need an operator  such that: σ([α1 , α2 ]) = σ(α1 )  σ(α2 ). If there exists such a  for σ, we call σ assossiative. We call unidatatype a derived datatype made of just one datatype (derived or not). This type or class of datatype is fairly frequent in user application codes and we therefore also would like to be able to eﬃciently compute their signature. where αi are predeﬁned constants in E. Let us deﬁne the type signature of the datatype X, σ(X), as the tuple σ(X) = (f (X), n). σ([X, Y ]) = σ(X)  σ(Y ). Given any integer a, (E, ⊕, ⊗) where E is the set of integer modulo a, ⊕ the integer addition modulo a and ⊗ the integer multiplication modulo a deﬁnes a ring. (Even a ﬁeld iﬀ a is prime.) A natural choice for α and a is α = 2 and a = 2w − 1 which deﬁnes the signature mmm-bs1. The multiplication of integers in E by power of 2 modulo 2w − 1 corresponds to a circular leftshift over w bits, c,w . This operation as well as the modulo 2w − 1 operation can both be eﬃciently implemented on a modern CPU. Since we are considering hash functions, we also want to compare to at least one class of hash functions that are known to be eﬃcient in term of computation time and quality. We choose to compare with the cyclic redundancy check. Stating brieﬂy if we want to have a w-bit CRC of the datatype X, we interpret X as a binary polynomial and choose another binary polynomial C of degree exactly equal to w (thus representing a number between 2w and 2w+1 − 1). The CRC, R, is the polynomial X × xw modulo C, that is to say: X.xw = Q.C + R. For a more detailed explanations we refer to . Various choices for C are given in the literature, we consider in this paper some standard value, for more about the choice of C, we referred to . The concatenation operation is possible with CRC signatures. If X = (xi )i=1,...,n and Y = (yi )i=1,...,m are two datatypes and we have computed their signatures σ(X) = (RX , n) σ(Y ) = (RY , m), then σ([X, Y ]) = (RZ , n + m) where RZ is RX xm + RY modulo Q. Even though it is possible given the signatures of two datatypes to compute the signature of the concatenation, the cost of this operation is proportional to the size of the second data-type (in our case m). This is an important drawback in comparison with the checksum where the cost of a concatenation is O(1). Although, it is not possible to compute quickly the signatures of a datatype composed of all the same datatype. Our software is available on the web . We believe it is high quality in the sense of eﬃciency, robustness and ease of use. It is provided with a comprehensive set of testing routines, timing routines and hash function quality assessment routines. The experimental results presented thereafter are based on this software and thus are meant to be easily reproducible. We can also verify the correctness of the theoretical results in part 3 through the software. In this paper, we assess that checksums based on Galois ﬁeld provide a quality of hashing comparable to CRCs (on our test problem). The big advantage of gfd is that the computation of signatures of unidatatypes is O(1) work and the computation of concatenations of two datatypes is O(1) work (CRCs are O(n) for those two special cases). In a typical application, having concatsignature and unisignature in O(1) leads to the computation of most signatures in O(1) times as well. Notes and Comments. The MPI standard requires the type signature (datatype, count) of the sender to ﬁt in the ﬁrst elements of the type signature (datatype, count) of the receiver. When the number of basic datatypes in the (datatype, count) of the receiver is longer than the number of basic datatypes in the (datatype, count) of the sender, the receiver needs to look inside the structure of its datatype to ﬁnd the point when the number of basic datatypes is the same as the one sent. The MPI correctness of the communication can then be assessed by checking if the signature of this part of the datatype matches the signature of the sender. Special care has to be taken for the datatypes MPI PACKED and MPI BYTE (see Gropp ). More information theory could have been exploited, for example, gfd(w = 8, m = 2) guarantees that any swap between two basic datatypes is detected as long as there is less than 253 basic datatypes in the two derived datatypes considered. These considerations are out of the scope of this paper. Report "Hash Functions for Datatype Signatures in MPI"